The outbreak of the latest intifada in October, accompanied by the intensification of Palestinian attacks against Israeli targets, which resulted in the death of 33 Israelis and the injury of over 250 others, provided the Israeli army with an excuse to further encroach on the West Bank under the pretext of a hot pursuit of Palestinian fugitives, without any distinction as to the statuses of Areas A, B and C. Such hot pursuits began after Israel launched Operation Defensive Shield in the West Bank in 2002 following suicide bombings undertaken by Palestinian factions between 2001 and 2002 within Israel, which killed and wounded hundreds of Israelis. The Oslo II Accord of 1995 divided the West Bank (5,844 square kilometers, or 2,256 square miles) between Palestinians and Israelis into three areas. Area A, where the majority of the Palestinian population is concentrated, is under the Palestinian Authority (PA) full civil and security control and its surface area represents 18% of the total land area of the West Bank. 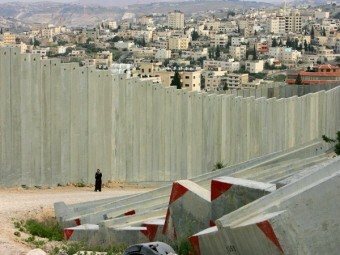 Area B, with a surface area of 21% of the West Bank, comprises the villages adjoining the main cities and falls under Palestinian civil control and Israeli security control. Area C — 61% of the West Bank — includes contiguous areas of the West Bank and falls under full Israeli security and civil control. The Israeli newspaper Haaretz reported April 7 that Israeli Prime Minister Benjamin Netanyahu had stated that the IDF's freedom of action in Area A is sacred, which paves the way for the IDF to enter all areas in the West Bank without differentiating between Areas A, B or C.
On the same day, Haaretz also reported that Education Minister Naftali Bennett warned that if the Israeli government decides to reduce the IDF’s operations in Palestinian cities of the West Bank, this may undermine the coalition’s stability, claiming that the IDF's control over Area A is a guarantee of Israel's security. By conducting hot pursuits in Area A, Israel aims to chase and arrest Palestinians wanted on security charges, including those planning to launch armed attacks against Israel. The Shin Bet compared these fugitives to a “ticking bomb,” claiming that it cannot afford to waste time by coordinating with the Palestinians before arresting the fugitives, who can exploit the situation to go underground and elude Palestinian security before launching their attack. It should be noted that in the period between October 2015 and March 2016, Israel was able to detain 3,000 Palestinian fugitives. Meanwhile, Israel insists on chasing Palestinians in Area A, although Maj. Gen. Roni Numa, the head of the IDF's Central Command, pointed that the PA is intensifying its activities against perpetrators. In its article, Haaretz reported that a senior official involved in the secret talks quoted Numa as saying that until a few months ago, Israel was handling 85% of counterterror activity in the West Bank and the PA only 15%. However, the equation changed in March, and the PA started handling 40% of the hot pursuits, with Israel security and military action in the West Bank dropping down to 60%. Nonetheless, Israel seems to only trust its security forces to maintain its security. On March 15, an Israeli political source told Hebrew radio on condition of anonymity that the secret talks with the Palestinians for putting certain areas under the PA’s security control led to a dead end since the Palestinians refused to meet the Israeli conditions, no understandings were reached regarding changing the pace of the security and military Israeli action in the West Bank; the source said the IDF will continue to operate wherever and whenever it deems necessary. Seven months into the intifada, and with the Israeli army continuing its operations in Area A, questions are raised as to the fate of the security talks that started in March 2015 between the two sides on the IDF’s redeployment in Palestinian cities such as Ramallah and Jericho. However, the ongoing hot pursuits may suggest an Israeli plan to take over some areas in the West Bank while keeping its security sway under different terminology such as security areas, armed intervention and securing settlements. It seems that the Israeli army enters Area A whenever it pleases and carries out armed pursuits. Sometimes Israeli authorities inform the PA about it and request intel concerning some armed groups. It should be noted that the Israeli army withdraws its troops after arresting the fugitives it is pursuing, which is what happened in cities such as Hebron, Nablus, Jenin and Ramallah. Although security coordination between the PA and Israel is ongoing, in recent months,the IDF has been carrying out incursions into Palestinian cities, while the Palestinian security services stood idly by. The IDF would only ask the Palestinian security services to evacuate security and police positions in which it planned to carry out a hot pursuit.